There are few things I love more than a lazy weekend morning watching Autumn leaves fall outside while sitting curled up with a delicious homemade breakfast. 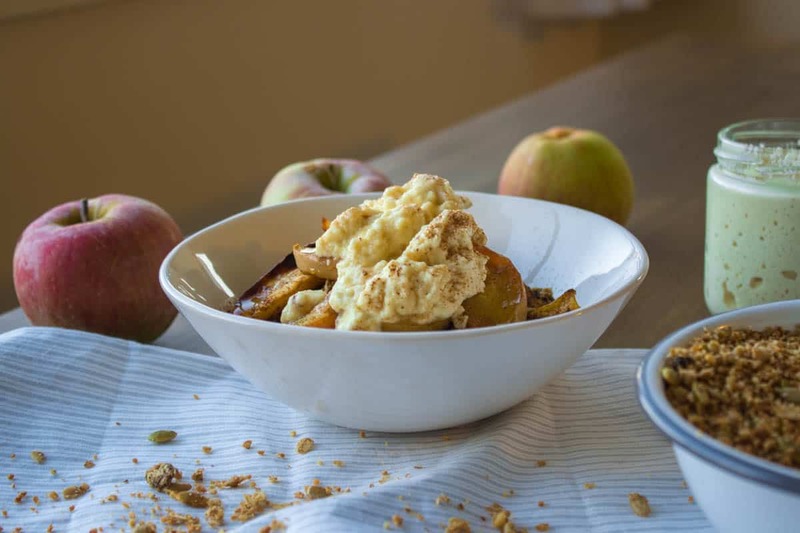 This Spiced Apple Granola with Vegan Ricotta is perfect for this time of year as apples are in season and are crisp and delicious. It’s great for slower mornings but also works really well when you’re on the go: simply make a batch of the granola the night before and broil/grill the apples in the morning (which only takes a few minutes). 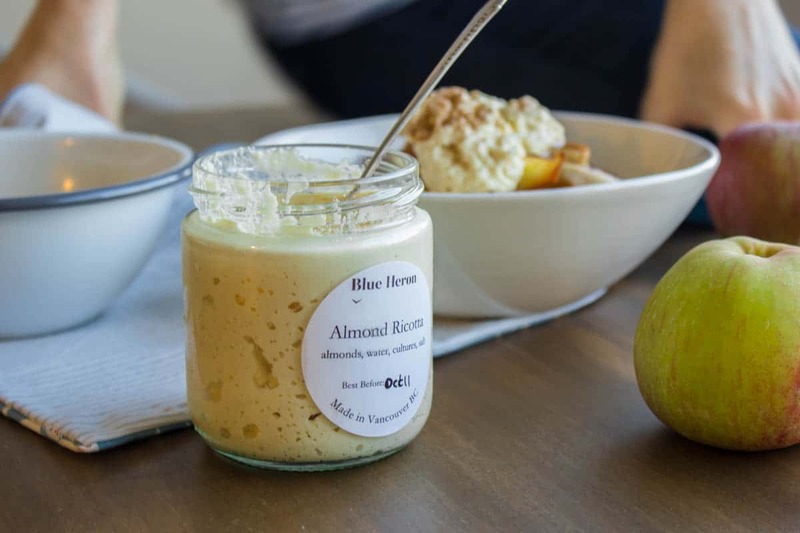 I was very fortunate recently that the lovely folks at Blue Heron Cheese gave me some of their Almond Ricotta to play with and it goes perfectly with this recipe! I’m a big fan of their products, but I usually buy their aged cheeses and – having never ventured very far into the world of cheese even when I was a vegetarian (I never liked the dairy taste) – I must admit to being a bit stumped upon receiving it, because I had little idea of what to do with it or how to use it in a recipe! Cue 10 minutes of Googling for inspiration however and I was set. What I hadn’t realized about ricotta is just how versatile it is. It’s perfect in sweet or savoury dishes such as lasagna and cheesecake, although for this recipe I’ve opted for sweet. 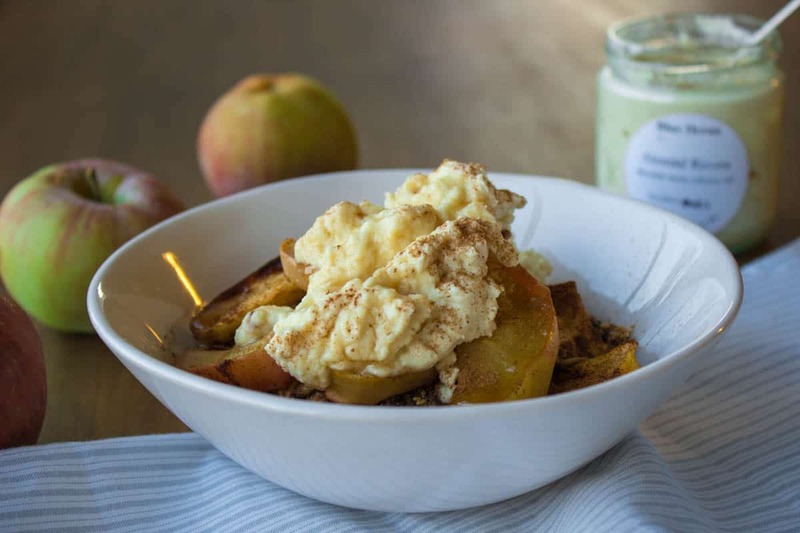 I find the tang of this cultured almond cheese is the perfect compliment to a warm, sweet breakfast bowl of spiced apple granola. If however you’re not as lucky as me and don’t live in Vancouver BC, never fear! Blue Heron make (in my opinion) the best artisan vegan cheeses, but there are many other great companies making plant-based cheese out there, and you’re absolutely welcome to substitute in your own favourite brand. This granola also works beautifully using coconut yoghurt instead of cheese, so there are plenty of options! Blue Heron Almond Ricotta, or your favourite vegan ricotta/coconut yoghurt etc. Preheat the oven to 150°C/300°F. To make the granola, pulse the almonds and walnuts in a blender until they look chopped. You don’t want them to be tiny crumbs – it’s better if they’re slightly larger and still have some texture. Add the nuts and all other dry ingredients to a large bowl and mix with a wooden spoon. Add the oil and maple syrup (if using) and mix well. Spread the mixture out (about 1cm thick) over a large baking sheet lined with parchment paper and bake in the oven for 20 minutes, or until the granola starts to look golden. Remove from the oven and leave to cool before breaking the granola into pieces. To make the grilled apples, remove the cores and chop them into 0.5cm slices. Rub them very lightly with coconut oil and place on a baking sheet, dusting over them with cinnamon. Using your oven’s grill/broiler (top heat only), broil the apple slices for 5 minutes, then flip them over with a spatula and broil for another 5. 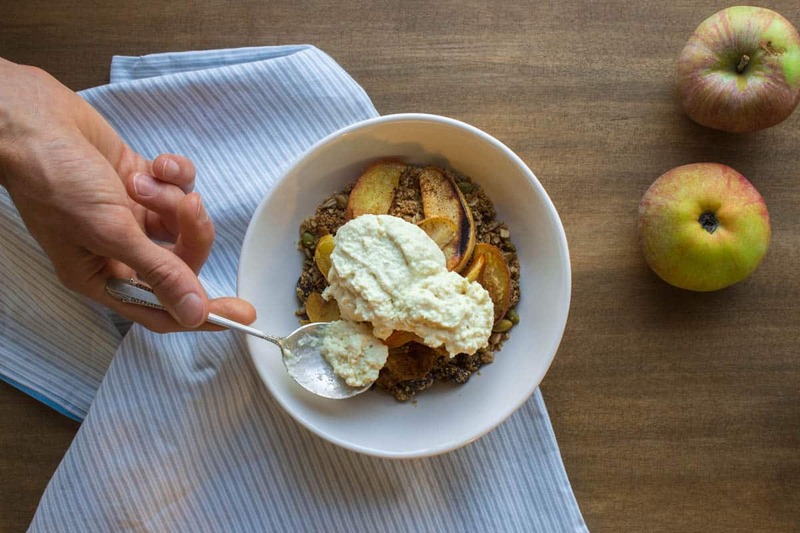 To serve, divide the granola between two warm bowls, add the spiced apple slices and spoon over a generous dollop of almond ricotta. Finish off with a dusting of cinnamon and a drizzle of maple syrup et voila!